‘Infernal Affairs’ is amazing. This was the original ‘Departed’ film that Scorsese made. ‘Infernal Affairs’ was made in 2002 with ‘The Departed’ being made in 2006. Scorsese must have seen this movie when it came out and quickly wanted to make an American version. And that’s exactly what he did. ‘Infernal Affairs’ is exactly what ‘The Departed is, but made in Hong Kong. It has a lot of the same scenes, characters, and plot lines. And this bluray release is quite good. If you are a fan of ‘The Departed’, then ‘Infernal Affairs’ is a film you will love. 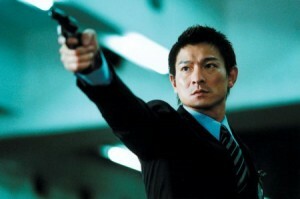 Like I said above, if you have seen ‘The Departed’, then you know the gist of the story of ‘Infernal Affairs’. Both films are great. They each stand alone, although they have some of the same scenes such as; the opening sequence, the rooftop mistake, the misspelling of the envelope letter, the movie theatre chase, and of course the big climax in the elevator at the end. And so the story you know goes like; two moles, an undercover cop, Chen Wing Yang (Tony Leung), who infiltrates a big crime organization, and a criminal, Lau Kin Ming (Andy Lau), who poses as a police officer, but really works from the crime lord. As both moles work tirelessly at their jobs, both sides realize there are snitches among them and they try to figure out who it is. Suspense elevates as the two come to ahead and tons of twists and turns and a huge climax comes in the end. It truly is a great story. It’s kind of difficult to talk about ‘Infernal Affairs’ by itself without comparing it to ‘The Departed’, but the movie does really stand on its own. It’s gritty, thrilling, and one hello of a cop action drama. 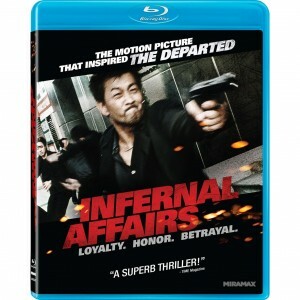 It’s great to see the similarities and differences between ‘Infernal Affairs’ and the Scorsese film. Highly recommended. ‘Infernal Affairs’ has a 1080p transfer with a 2.35:1 aspect ratio. This is a very gritty and stylistic film. There is a very light layer of grain throughout which gives you that raw “in the moment” feel. There is also a bit of edge enhancement which gives some of the actors and items halos and some for of an unnatural feel. All the colors are muted to give you that sordid feel, but it takes away all the vibrant colors which would make this movie shine and pop. All these things were intentional to make the film look raw, but it felt flat. Although the blacks are deep and the look is very stylish, i would have preferred a more colorful transfer. The audio is presented with a Cantonese DTS-HD Master Audio 5.1 mix and an English DTS-HD Master Audio 5.1 dub with optional English. There is an exhilarating score, some cool action beats, and great dialogue to give your speakers a good workout. All the dynamics are robust with the dialogue being crisp and clear with no cracks or hissing. The big action scenes are a lot of fun with tons of bullets flying all over and the ambient sounds going on around you. I enjoyed the audio better than the video presentation on this release. The Making of Infernal Affairs (SD, 15 min) – I hoped for more. This is your standard promo featurette with a bit of behind the scenes stuff, and some cast and crew interviews. The interviews mostly discuss the film’s themes and the object of good and evil. Confidential Files: A Behind-the-Scenes Look at Infernal Affairs (SD, 6 min) – This was definitely cool. This is more of a gritty behind the scenes look at filming the movie. It was neat to see how they shot some of the sequences. All to short. Alternate Ending (SD, 3 min) – An alternate ending that changes everything, but I’m glad they stuck with the ending we all know. International Trailer (SD, 2 min) – The film’s international trailer is included with no subtitles. Original Chinese Trailer (SD, 2 min) – The film’s original Chinese trailer is included with no subtitles. Trailers (HD) – Several trailers for other Lionsgate releases are here. This will forever be known as the the movie ‘The Departed’ was based on. However it does stand alone from that film. The raw video transfer looks goof, but I wish it was more vibrant. While the audio is not really demo worthy, it still packs a punch, and the extras are a lot of fun. The storyline, acting, and stylish camerawork make ‘Infernal Affairs’ one to own. Love this movie. Would be a great double feature with Scorsese’s ‘The Departed’. This entry was posted on Tuesday, January 24th, 2012 at 5:15 pm	and is filed under Film. You can follow any responses to this entry through the RSS 2.0 feed. You can skip to the end and leave a response. Pinging is currently not allowed. « Geek Deal of the Day!!! ‘The Office’ Seasons 5 & 6!!! Over 70% Off!!! Under $18.00 Dollars!! !